There is an open source (i.e. free) game called Frets on Fire that is very similar to Guitar Hero. Also, if you look around on the internet there are places where you can download the songs for Guitar Hero I,II,Encore, and III to be imported into FoF. So FoF was looking like a pretty good replacement for Guitar Hero on my Wii while I waited for Activision to send me the game back. It would also allow me to play the other Guitar Hero games that have not been released on the Wii. There was just one problem: by default, you play FoF with the keyboard. I wanted to play FoF with my Wii guitar, and it turns out this is something that can be accomplished fairly easily. The one thing I needed to buy was a bluetooth adapter for my computer. If you were not aware, the Wii remote communicates with the Wii via bluetooth. I found this adapter at Newegg for ~$13 including shipping. Once I received the bluetooth adapter I installed Frets on Fire on my computer. I had problems with the most recent release of FoF, so if you want to play with the game I would currently recommend installing the 1.2.451 version here. Once I had FoF installed and working, the next step was to get the Wii remote communicating with my computer. I followed the instructions here to get my Wii remote talking to the computer. You put the wii remote into synching mode and then the computer sees it and you configure it as a Human Interface Device. It was a little tricky, but seems to be working pretty consistently now. Once I had the Wii remote communicating with the computer, I needed a way to interpet the key presses on the remote. I accopmlished this with a program called GlovePIE that emulates joystick and keyboard input for multiple devices including the Wii remote. I then found a GlovePIE script on HonkeyKong.org that maps the Wii GHIII controls to keypresses in Frets on Fire. I actually modified the script a little for myself to invert the up/down joystick controls and to allow left and right joystick movement as well. If you would like to use my script, you can download it here. Well, that's about it. I can now play Frets on Fire using the Wii guitar, and it works very well. I just synch up the Wii remote, launch GlovePIE using the script, and then launch Frets on Fire. Background I haven't mentioned it on my blog, but if you listen to my podcasts you know that the original release of the Wii edition of Guitar Hero III had some sound issues. Specifically, the music is played in mono when it is supposed to be Dolby 5.1. Activision has fixed the problem and is offering to replace discs for free. However, they require that you send the original disc back to them before they send you the corrected disc. They also ask that you "allow up to 4 weeks" after they receive your disc before you receive the replacement. Four weeks without Guitar Hero is unacceptable... There is an open source (i.e. free) game called Frets on Fire that is very similar to Guitar Hero. Also, if you look around on the internet there are places where you can download the songs for Guitar Hero I,II,Encore, and III to be imported into FoF. So FoF was looking like a pretty good replacement for Guitar Hero on my Wii while I waited for Activision to send me the game back. It would also allow me to play the other Guitar Hero games that have not been released on the Wii. There was just one problem: by default, you play FoF with the keyboard. I wanted to play FoF with my Wii guitar, and it turns out this is something that can be accomplished fairly easily. The How To The one thing I needed to buy was a bluetooth adapter for my computer. If you were not aware, the Wii remote communicates with the Wii via bluetooth. I found this adapter at Newegg for ~$13 including shipping. Once I received the bluetooth adapter I installed Frets on Fire on my computer. I had problems with the most recent release of FoF, so if you want to play with the game I would currently recommend installing the 1.2.451 version here. Once I had FoF installed and working, the next step was to get the Wii remote communicating with my computer. I followed the instructions here to get my Wii remote talking to the computer. You put the wii remote into synching mode and then the computer sees it and you configure it as a Human Interface Device. It was a little tricky, but seems to be working pretty consistently now. Once I had the Wii remote communicating with the computer, I needed a way to interpet the key presses on the remote. I accopmlished this with a program called GlovePIE that emulates joystick and keyboard input for multiple devices including the Wii remote. I then found a GlovePIE script on HonkeyKong.org that maps the Wii GHIII controls to keypresses in Frets on Fire. I actually modified the script a little for myself to invert the up/down joystick controls and to allow left and right joystick movement as well. If you would like to use my script, you can download it here. Well, that's about it. 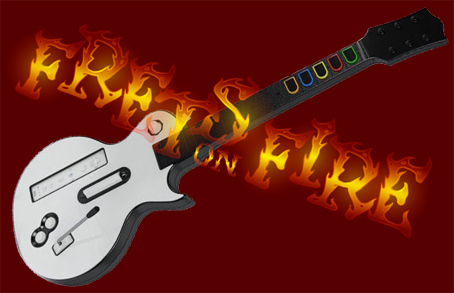 I can now play Frets on Fire using the Wii guitar, and it works very well. I just synch up the Wii remote, launch GlovePIE using the script, and then launch Frets on Fire.